Tie down systems are designed to secure scooters and wheelchairs into vehicles. In an accident, or even a quick stop, a wheelchair or scooter can fly through the vehicle causing damage to the vehicle and injury to the passengers or driver. 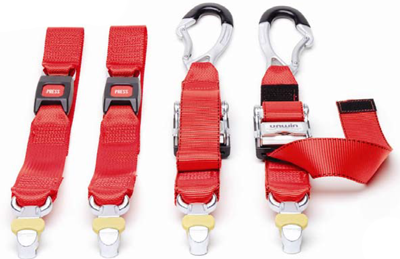 Tie Down Straps - Tie down straps consist of four straps that are attached to tracks or plates on the van floor. The wheelchair or scooter is positioned between the straps. The caregiver hooks the straps to the wheelchair or scooter and tightens them to tie the mobility device to the van. Docking Device - A docking device is a mechanism bolted to the van floor that is used to secure a wheelchair to the vehicle (docking devices are not designed to secure scooters.). A hook, pin or bracket is attached to the wheelchair that engages with the docking device when the wheelchair is pushed or driven over the docking devices. The device "grabs" the wheelchair bracket and secures the wheelchair in place. The docking device is electrically operated and it will release the wheelchair when a button is depressed. Users of power and manual wheelchairs can legally be transported while sitting in their wheelchair provided the wheelchair and the user are properly secured. The wheelchair is secured by the tie down system, whether strap type or docking device. The wheelchair user must be secured by a seat belt. Some strap designs include a seat belt. Because docking stations are usually located in place of an existing van seat the van seat belts can often be used. There are a variety of aftermarket seat belt systems available including various combinations of lap belts, shoulder harnesses, combination belts and integrated systems. Seat belts that come with a wheelchair are not intended to keep the user safe while being transported in a vehicle. Seat belt systems are designed to be installed and used with the wheelchair facing the front of the van. While it may be easier to load a wheelchair sideways into a van it is not safe to be facing the side of the van while being transported regardless of whether or not a seat belt is used. While it is important to secure scooters into vans and other vehicles while being transported, scooter seats are not designed to be used as a seat in a vehicle. Scooter users should be transported sitting on a vehicle seat using the vehicle seat belts or use a wheelchair in the vehicle with a proper tie down system including seat belt for safety. 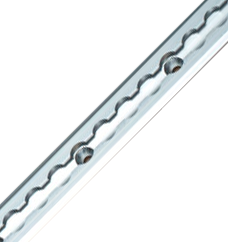 Strap systems - to install a strap system steel plates, anchors or tracks are bolted to the floor of the van. Steel tracks offer more options for wheelchair placement and size than plates do and are most commonly found in buses and handivans. Docking devices - docking devices are bolted directly to the floor of the van. They can be positioned just about anywhere inside the van and are often mounted where the drivers seat is located so users can drive from their wheelchair.